The ultra-marathon that I signed up for just 5 weeks earlier was actually going well. The 50k race kicked off at 6:15 am and yes, it was a humid day and the course was indeed hilly, but that was the challenge. Now, only training for few weeks and competing in itself was Mentally Tough and Stupid. But, what I learned about myself was nothing at all like I imagined or even considered. For the first 12.5 miles, my pace was good, chatting with other competitors, and feeling strong until I stopped at the first major aid station. I saw my family (like planned) at the aid station, and had a small bite to eat, changed shirts, and drank some water. Although, in the moment, I simply forgot to consume my SOS rehydrate electrolyte drink mix. I just forgot…Mistake #1. The next aid station was eight hilly miles away at mile 20, and as I took off down the long hill to the bottom and started the long climb back to the next summit, I started to worry. I began to worry (Mistake #2) because I began to have all of these minor setbacks, 1) I was with a group of about 5 runners and they dropped me, I just couldn’t keep pace, 2) My achilles that I strained in training started to really hurt, and it affected my stride, 3) My quads started to seize up, and 4) I started walking more and only running the downhills. I was walking and not even running the sparse flat sections. I felt I had already gone through my 2nd wind, and my 3rd and 4th winds as well. I was on fumes… I knew I just needed to get to the next aid station and be able to eat and relax there for a bit. I was relying on my mental game of “just keeping moving forward.” I could do one foot in front of the other. I could make it to the next tree and then I could make it to the next aid station. I was reminded of this simple technique from my latest podcast guest Luke Tyburski! I finally made it to the aid-station at mile 20 and then it all went really wrong. I didn’t have a real plan at the mile 20 station, even though I had great nutrition (a 33 shake pack) with me, I somehow forgot that it was there. My race plan consisted of using my shake pack and then making it to mile 24 for some serious re-fueling. But, I was feeling so poor that as I sat at the mile 20 aid station, I started to down water, gatorade, mountain dew, and I ate orange slices, peanuts & raisins, cookies, saltine crackers. NOW, I was ready to continue, 4.5 miles to the next aid station where my family would again be and even though I knew this was some rocky terrain coming up, I could make it. One foot in front of the other. I started out running all the way to the bottom again, and started the off-road trek to the next summit. But, on the way up, I started to feel nauseous! (I know, crazy right?!) I had to actually stop and sit on the hill, because I had to vomit! Except I didn’t want to vomit! I hate puking! I had to keep moving, I had to just keep moving. I made it to the top of the hill and then I actually did throw up (a bit). And I felt better, but just for a minute. With two miles to go until the next aid station, I felt nauseous again and kept stopping and sitting, just wanting to throw up. I even stuck my finger down my throat to make it all come up (I just gagged, that didn’t work either). It’s humbling, demoralizing actually having to stop every few hundred yards and sit! Every person that passed me asked the same question “dude, are you okay?” “oh yes, I fine!” I replied, I mean what else am I going to say then anyways? About a half-mile up to the top of the aid-station,it all finally came up! Three or four projectile vomits and it was indeed a God send! Thank you Lord! Right after that, I walked all the way to the top of the hill, no static, no issues at all. Now, I just needed to replenish everything I lost. At the aid station, I saw my family, and started consuming water and electrolytes. It was all going down okay! I was going to be fine! That feeling of joy merely lasted a few minutes though because when I looked at the food,I wanted NONE of it! My body was in straight rejection mode. It had ran 24.5 miles and was focused on that task, my body wasn’t planning on now having zero fuel and acid build-up in the stomach to contend with. Then, I got the chills! It was 70+ degrees and I have the chills! Oh great, now what? My buddy Bill was there at that aid station for support and even he was concerned. My wife told me “your lips are blue and your eyes are sunken in!” I didn’t want to hear any of that outside noise, I had 8.5 miles left, and I needed to focus on keeping moving forward. Now according to webmd.com, there are 63 possible causes of vomiting and getting the chills at the same time. I was not aware of this at the moment of course, but all I knew is that I was in no position to argue with what happened next. Sorry if it grosses you out, but it all came up again! Serious projectile vomit! And I don’t know about you, but it’s odd that when I threw up, more came up, than ever went down. How is that possible? My two kids witnessed it all and they started crying! The sky opened up and it started to POUR! It dumped buckets and buckets of rain! A great feeling if you’re actually running, but for me it was a sign of failure. I needed more time to recoup and instead I retreated to shelter and my wife told the race officials at the aid station; “he’s stopping.” Funny, but later my wife mentioned how the officials commented on a lot of runners had done the same thing. I sat in the car, thunderstorm going on outside and I’m literally crushed. I felt like a failure! Mentally Tough? PShaw! I passed out in the car, got back to the cabin, took a hot shower, still had the chills, and puked again. This time though it was all acid and dry heaves- the worst kind. I laid down and passed out. When I came to about 30 minutes later, they had returned from grabbing lunch and then they laid down to take a nap. But, I was awake and even though I couldn’t eat, I slowly drank a bottle of water. After another 30 minutes, I finally felt like I could eat, so I nibbled on a chicken finger (ha) that they had brought back for me. It stayed down, and I slowly drank some more water… I then had the other chicken finger and it stayed down. Then I started to feel better, more back to normal! I thought about everyone in my life, my kids, wife, Izzy, my friends, family and I thought about myself. It became a “who are you?” moment. Sure, other people would understand why I dropped, but that didn’t matter. Could I look myself in the eye and tell other people to never give up?!? NO! I had my SOS Rehydrate and then woke up my family and told them the good news! This is the part about being mentally tough and stupid! They thought I was kidding for a second, but then they knew it was for real, so we went back. Two and half hours after I dropped, I checked back in with the race officials exactly where I stopped and went to finish my last 8.5 miles of the race. They were a bit in shock, but I had my 33 shake pack and my SOS, I WAS going to finish! Now, the rain had made the rest of the course a bloody muddy pit. If you’ve ever seen a fire department create a mud bog, this was it. I just tried to keep my shoes on and ran when I actually could manage to do so. The last 8.5 miles took me two hours and fifteen minutes. I hooked up with a 50-miler guy about a mile in and we ran/sloshed the rest of the way and finished together. 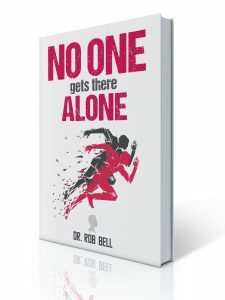 No One Gets There ALONE. I finished last! But, I finished. That beats those who didn’t finish. We have to be able to answer that question before it’s even asked! When our moment hits, it’s too late to prepare, we need to be ready! Commitment means finishing what we started, no matter how bad the situation or the circumstance. We are our vision or our circumstance! This isn’t a quiz and there isn’t a right or wrong answer! You’ll have to decide! Would you have stopped? I was mentally tough and stupid. Maybe they are linked together, I’m not sure. We all live with fear, so let’s couple it with arrogance. It may sound self-fish, but I was an am thinking of my family, I want them to be that passionate about their own journey and be willing to push themselves past their own barriers and limitations. It’s not the lesson I thought I learn during this race. I can at least still share my philosophy about the power to Never Give Up!